Embodiments of an electrolyte for a hybrid magnesium-alkali metal ion battery are disclosed. The electrolyte includes a magnesium salt, a Lewis acid, and an alkali metal salt. Embodiments of battery systems including the electrolyte also are disclosed. This application is a continuation-in-part of U.S. patent application Ser. No. 14/084,075, filed Nov. 19, 2013, which is incorporated herein in its entirety. This invention was made with government support under DE-AC0576RLO1830 awarded by the U.S. Department of Energy. The government has certain rights in the invention. The invention concerns embodiments of a mixed magnesium-alkali metal electrolyte for use in a hybrid magnesium-alkali metal ion battery. Rechargeable magnesium (Mg) batteries have gained increasing attention as promising battery systems as an alternative to lithium-based batteries for grid-scale energy storage, powering portable devices and transportation applications. As an anode material, magnesium inherently possesses a number of advantages over lithium: it is safe to use (compared to lithium metal anodes), it does not form significant amounts of dendrites, it is earth abundant and low cost (about 24 times cheaper than lithium), and it has a high volumetric capacity (3832 Ah/L vs. 2062 Ah/L for Li) due to the divalent nature of the Mg2+/0 redox couple. In addition, Mg has a high reduction potential (−2.37 vs. SHE) amenable for assembling high voltage and high energy density batteries with suitable cathode materials. Although the magnesium anode is highly attractive, the lack of compatible cathodes for Mg ion intercalation is one of the primary hurdles for developing practical rechargeable Mg-batteries. Additionally, magnesium metal anodes and magnesium intercalation anodes have electrode potentials that are approximately one volt higher than those of lithium. When coupled with a cathode, compared to lithium, the working voltage of magnesium cells is lower. This can mean that the energy density of magnesium batteries is also decreased. A hybrid battery permits the use of other intercalating cathodes (e.g., alkali metal-ion intercalating cathodes), while taking advantage of the magnesium anode's merits. A major challenge for producing hybrid rechargeable magnesium-alkali metal ion batteries is the need for chemically and electrochemically reliable electrolytes. Existing electrolytes are chemically incompatible, meaning that components of the electrolyte may have undesirable side reactions with one another during storage and/or battery operation. For example, an electrolyte including LiBF4 and C6H5MgCl suffers from a side reaction of nucleophilic attack by BF4− on C6H5− ((Yagi, S. et al. J. Mater. Chem. A, 2014, 2, 1144-1149). Embodiments of a mixed magnesium-alkali metal electrolyte and hybrid magnesium-alkali metal ion batteries including the electrolyte are disclosed. Embodiments of an electrolyte for a hybrid Mg-alkali metal ion battery include a magnesium salt other than RMgX or MgR2 wherein R is alkyl or aryl and X is halo, a Lewis acid, an alkali metal salt, and a solvent. In some embodiments, the magnesium salt is MgX2, Mg(PF6)2, Mg(OR1)2, Mg(CF3SO3)2, Mg(N(CF3SO3)2)2, Mg(ClO4)2, or a combination thereof, wherein X is halo and R1 is aliphatic, aryl, alkoxy, aryloxy, thiolate, or amide. In any or all of the above embodiments, the alkali metal salt may be MX, MPF6, MAlCl4, MB(C2O4)4, MClO4, MH2PO4, M(CF3SO3)2, M(N(CF3SO3)2)2, M(BR2 aX4−a), M(AlR2 aX4−a), M(GaR2 aX4−a), M(AsR2 aX4−a), MCN, MSCN, or a combination thereof, where M is an alkali metal, X is halo, 0≦a≦4, and each R2 independently is aliphatic, aryl, alkoxy, aryloxy, thiolate, or amide. In some embodiments, M is Li, Na, K, or a combination thereof. In any or all of the above embodiments, the electrolyte may have a composition wherein 0.4 M≦[Mg]≦2 M, 0.4 M≦[alkali metal]≦3 M, or 0.4 M≦[Mg]≦2 M and 0.4 M≦[alkali metal]≦3 M. In any or all of the above embodiments, the electrolyte may have a composition wherein 0.4 M≦[Mg]+[alkali metal]≦5 M. In some embodiments, 0.4 M≦[Mg]≦2 M, 0.4 M≦[alkali metal]≦3 M, 0.8 M≦[Mg]+[alkali metal]≦5 M, or a combination thereof. In any or all of the above embodiments, the magnesium to alkali metal molar ratio may be in the range of from 0.5 to 2. In any or all of the above embodiments, the Lewis acid may comprise a metal M′ and one or more supporting ligands comprising one or more halide anions X, one or more organic anions R3, or a combination thereof. In an independent embodiment, the metal M′ is B, Al, Ga, In, Fe, or a combination thereof. In another independent embodiment, each organic anion R3 independently is alkyl, aryl, alkoxide, aryloxide, thiolate, or amide. In another independent embodiment, the Lewis acid is M′R3 zX3−z, where 0≦z≦3. In any or all of the above embodiments, the Lewis acid may be Al(C6H5)3, AlCl3, CH3CH2AlCl2, GaCl3, or a combination thereof. In any or all of the above embodiments, the magnesium salt may be MgCl2, the Lewis acid may be Al(C6H5)3, CH3CH2AlCl2, or a combination thereof, and the alkali metal salt may be LiCl, LiAlCl4, NaCl, NaAlCl4, or a combination thereof. Embodiments of a rechargeable hybrid Mg-alkali metal ion battery system include (a) an electrolyte comprising (i) a magnesium salt other than RMgX or MgR2 wherein R is alkyl or aryl, and X is halo, (ii) a Lewis acid, (iii) an alkali metal salt, and (iv) a solvent; (b) a magnesium anode; and (c) an alkali metal ion cathode. In some embodiments, the alkali metal ion cathode is a lithium ion cathode or a sodium ion cathode. In certain embodiments, the lithium ion cathode comprises Li4Ti5O12, LiFePO4, LiCoO2, LiMn2O4, LiNiMnCoO2, or LiNiCoAl2. In such embodiments, the electrolyte may comprise (i) MgCl2; (ii) Al(C6H5)3, CH3CH2AlCl2, or a combination thereof; and (iii) LiCl, LiAlCl4, or a combination thereof. In certain embodiments, the sodium cathode comprises NaTiS2, NaNi2S2, NaCu2S, NaFeF3, NaFePO4, NaMnPO4, NaCaPO4, Na3V2(PO4)3, Na0.44MnO2, or NaNi0.5Mn0.5O2. In such embodiments, the electrolyte may comprise (i) MgCl2; (ii) Al(C6H5)3, CH3CH2AlCl2, or a combination thereof; and (iii) NaCl, NaAlCl4, or a combination thereof. FIG. 1 is a schematic cross-section of one embodiment of a rechargeable magnesium-alkali metal ion battery. FIG. 2 is a series of cyclic voltammograms of exemplary electrolytes with magnesium salt, Lewis acid, and varying concentrations of alkali metal salt. FIG. 3 is a series of cyclic voltammograms of exemplary electrolytes with varying concentrations of magnesium salt, Lewis acid, and alkali metal salt. FIG. 4 shows repeated cyclic voltammograms of an exemplary electrolyte comprising 2 MgCl2—AlPh3 (0.5 M) and LiAlPh3Cl (1.2 M). FIG. 5 shows 30 cycles of charge and discharge data obtained at different charge rates for an exemplary hybrid Mg—Li ion cell including a Li4Ti5O2 cathode, a magnesium anode, and an exemplary electrolyte comprising 0.2 M MgCl2—AlCl3 and 0.2 M LiAlCl4 in THF. FIG. 6 shows representative charge and discharge profiles for the hybrid Mg—Li ion cell of FIG. 5. FIG. 7 shows representative charge and discharge profiles for an exemplary hybrid Mg—Li ion cell including a LiFePO4 cathode, a magnesium anode, and an exemplary electrolyte comprising 2 MgCl2—AlPh3 (0.2 M) and LiAlCl4 (0.4 M) in THF. FIG. 8 shows charge and discharge data for the cell of FIG. 7 over 20 cycles. Embodiments of a mixed magnesium-alkali metal electrolyte for use in a hybrid magnesium-alkali metal ion battery are disclosed. The electrolyte comprises a magnesium salt, a Lewis acid, and an alkali metal salt. Hybrid magnesium-alkali metal ion batteries including embodiments of the electrolyte also are disclosed. Unless otherwise indicated, all numbers expressing quantities of components, percentages, temperatures, concentrations, and so forth, as used in the specification or claims are to be understood as being modified by the term “about.” Accordingly, unless otherwise indicated, implicitly or explicitly, the numerical parameters set forth are approximations that may depend on the desired properties sought and/or limits of detection under standard test conditions/methods as known to those persons of ordinary skill in the art. When directly and explicitly distinguishing embodiments from discussed prior art, the embodiment numbers are not approximates unless the word “about” is recited. Aliphatic: A substantially hydrocarbon-based compound, or a radical thereof (e.g., C6H13, for a hexane radical), including alkanes, alkenes, alkynes, including cyclic versions thereof, and further including straight- and branched-chain arrangements, and all stereo and position isomers as well. Unless expressly stated otherwise, an aliphatic group contains from one to twenty-five carbon atoms; for example, from one to fifteen, from one to ten, from one to six, or from one to four carbon atoms. The term “lower aliphatic” refers to an aliphatic group containing from one to ten carbon atoms. An aliphatic chain may be substituted or unsubstituted. Unless expressly referred to as an “unsubstituted aliphatic,” an aliphatic group can either be unsubstituted or substituted. An aliphatic group can be substituted with one or more substituents (up to two substituents for each methylene carbon in an aliphatic chain, or up to one substituent for each carbon of a —C═C— double bond in an aliphatic chain, or up to one substituent for a carbon of a terminal methine group). Exemplary substituents include, but are not limited to, alkyl, alkenyl, alkynyl, alkoxy, alkylamino, alkylthio, acyl, aldehyde, amide, amino, aminoalkyl, aryl, arylalkyl, carboxyl, cyano, cycloalkyl, dialkylamino, halo, haloaliphatic, heteroaliphatic, heteroaryl, heterocycloaliphatic, hydroxyl, oxo, sulfonamide, sulfhydryl, thioalkoxy, or other functionality. Alkyl: A hydrocarbon group having a saturated carbon chain. The chain may be cyclic, branched or unbranched. The term lower alkyl means the chain includes 1-10 carbon atoms. Alkoxy/alkyl oxide: A functional group having the formula RO— where R is alkyl. Amido: A chemical functional group —C(O)N(R)(R′) where R and R′ are independently hydrogen, alkyl, heteroalkyl, haloalkyl, aliphatic, heteroaliphatic, aryl (such as optionally substituted phenyl or benzyl), heteroaryl, alkylsulfano, or other functionality. Anode: An electrode through which electric charge flows into a polarized electrical device. In a discharging battery, the anode is the negative terminal where electrons flow out. When the anode is composed of a metal, electrons that it gives up to the external circuit are accompanied by metal cations moving away from the electrode and into the electrolyte. When the battery is recharged, the anode becomes the positive terminal where electrons flow in and metal cations are reduced. Aryl: A monovalent aromatic carbocyclic group of, unless specified otherwise, from 6 to 15 carbon atoms having a single ring (e.g., phenyl) or multiple condensed rings in which at least one ring is aromatic (e.g., quinoline, indole, benzodioxole, and the like), provided that the point of attachment is through an atom of an aromatic portion of the aryl group and the aromatic portion at the point of attachment contains only carbons in the aromatic ring. If any aromatic ring portion contains a heteroatom, the group is a heteroaryl and not an aryl. Aryl groups are monocyclic, bicyclic, tricyclic or tetracyclic. Aryloxy/aryl oxide: A functional group having the formula RO— where R is aryl. Capacity: The capacity of a battery is the amount of electrical charge a battery can deliver. The capacity is typically expressed in units of mAh, or Ah, and indicates the maximum constant current a battery can produce over a period of one hour. For example, a battery with a capacity of 100 mAh can deliver a current of 100 mA for one hour or a current of 5 mA for 20 hours. The specific capacity of a battery or an electrode is the amount of electrical charge a battery or electrode can deliver per unit mass of the battery or electrode. The specific capacity is typically expressed in units of mAh/g, or Ah/kg, and indicates the maximum constant current a unique weight of battery or electrode can produce over a period of one hour. For example, an electrode with a specific capacity of 100 mAh/g can deliver a current of 100 mA/g for one hour or a current of 5 mA/g for 20 hours. Cathode: An electrode through which electric charge flows out of a polarized electrical device. In a discharging battery, the cathode is the positive terminal where electrons flow in. Positive ions move from the electrolyte to the cathode, where they may be reduced. When the battery is recharged, the cathode becomes the negative terminal where electrons flow out and metal atoms are oxidized. Cell: As used herein, a cell refers to an electrochemical device used for generating a voltage or current from a chemical reaction, or the reverse in which a chemical reaction is induced by a current. Examples include voltaic cells, electrolytic cells, redox flow cells, and fuel cells, among others. An electrochemical cell includes two half-cells. Each half-cell comprises an electrode and an electrolyte. A magnesium-alkali metal ion battery has a positive half-cell in which a cathode intercalating alkali metal ions is oxidized, and a negative half-cell in which magnesium ions are reduced during charge. Opposite reactions happen during discharge. Multiple single cells can form a cell assembly, often termed a stack. A battery includes one or more cells, or even one or more stacks. The terms “cell” and “battery” are used interchangeably when referring to a battery containing only one cell. Coin cell: A small, typically circular-shaped battery. Coin cells are characterized by their diameters and thicknesses. For example, a type 2325 coin cell has a diameter of 23 mm and a height of 2.5 mm. Current density: A term referring to the amount of current per unit area. Current density is typically expressed in units of mA/cm2. Electrolyte: A substance containing free ions that behaves as an ionically conductive medium. Hybrid: As used herein, the term “hybrid” refers to a battery or cell having a magnesium anode and a cathode that intercalates alkali metal ions. The cathode may intercalate multiple ions, including alkali metal ions and Mg ions. Lewis acid: A molecule or ion that is an electron pair acceptor; a molecule or ion that forms a covalent bond by accepting two electrons—a lone pair—from a second molecule or ion. Exemplary Lewis acids include, but are not limited to, H+, BF3, and AlCl3. Nucleophile: An ion or molecule capable of donating an electron pair to an atomic nucleus (i.e., an electrophile) to form a covalent bond. The term “nucleophilic” means having an affinity for an atomic nucleus. Thiolate: A functional group having the formula RS— where R is aliphatic or aryl. Embodiments of the disclosed electrolyte for a hybrid Mg-alkali metal ion battery comprise a magnesium salt, a Lewis acid, and an alkali metal salt. Embodiments of the electrolyte further comprise a solvent. The electrolytes may consist essentially of, or consist of, a magnesium salt, a Lewis acid, an alkali metal salt, and a solvent. As used herein, “consists essentially of” means that the electrolyte may include other components that do not affect the performance of the magnesium-alkali metal ion battery during charging/discharging. Typical additives that do not affect the battery performance may include halide salts such as NH4Cl or Et4NCl. Advantageously, the magnesium salt does not provide nucleophilic Mg2+ species when solvated by a solvent. Nucleophilic Mg2+ species may be chemically incompatible with Lewis acids, electrolyte solvents and even cathode materials, e.g., undesirable side reactions between the anions of the magnesium salt and the Lewis acid may occur in the electrolyte. Accordingly, the magnesium salts of the disclosed embodiments do not include RMgX or MgR2 wherein R is alkyl or aryl and X is halo. For example, the magnesium salt is not C6H5MgCl. In an independent embodiment, the magnesium salt does not include a borohydride (BH4−) anion. Suitable magnesium salts include, but are not limited to, MgX2, Mg(PF6)2, Mg(OR1)2, Mg(CF3SO3)2, Mg(N(CF3SO3)2)2 (also known as Mg(TFSI)2), Mg(ClO4)2, or a combination thereof, wherein X is halo and R1 is aliphatic, aryl, alkoxy, aryloxy, thiolate, or amide. In some embodiments, the magnesium salt is MgX2. In an independent embodiment, the magnesium salt is MgCl2. In, Fe, or a combination thereof. In an independent embodiment, the metal M′ is B, Al, or a combination thereof. In another independent embodiment, the metal is Al. Each organic anion R3 independently may be alkyl, aryl, alkoxide, aryloxide, thiolate, or amide. In an independent embodiment, R3 is alkyl, such as lower alkyl, or aryl. In another independent embodiment, R3 is ethyl or phenyl. In some embodiments, the Lewis acid has the formula M′R3 zX3−z, where 0≦z≦3. In other words, the Lewis acid is M′X3, M′R3X2, M′R3 2X, M′R3 3, or any combination thereof. In an independent embodiment, the Lewis acid is AlR3 zX3−z or BR3 zX3−z. In some embodiments, the Lewis acid is M′X3, M′R3X2, M′R3 2X, M′R3 3, or any combination thereof, wherein R3 is alkyl, such as lower alkyl, or aryl. Exemplary Lewis acids include AlCl3, Al(C6H5)3 (AlPh3), CH3CH2AlCl2 (AlEtCl2), AlCl2C6H5, AlCH3CH2F2, AlF2C6H5, GaCl3, GaCl2CH3CH2, GaCl2C6H5, BBr2CH3CH2, BBr2C6H5, and combinations thereof. In some embodiments, the magnesium salt is a magnesium halide, and the Lewis acid and magnesium halide comprise the same halogen. In an independent embodiment, the magnesium salt is MgCl2 and the Lewis acid is AlPh3 or AlEtCl2. Embodiments of the disclosed electrolytes include an alkali metal salt. Suitable alkali metal salts include, but are not limited to, MX, MPF6, MAlX4, MB(C2O4)4, MClO4, MH2PO4, M(CF3SO3)2, M(N(CF3SO3)2)2, M(BR2 aX4−a), M(AlR2 aX4−a), M(GaR2 aX4−a), M(AsR2 aX4−a), MCN, MSCN, or a combination thereof, where M is an alkali metal; X is halo; 0≦a≦4; and each R2 independently is aliphatic, aryl, alkoxy, aryloxy, thiolate, or amide. In one embodiment, the alkali metal salt does not include a borohydride anion. In an independent embodiment, the alkali metal salt is MX or MAlX4. In another independent embodiment, the alkali metal salt is MCl, MAlCl4, or a combination thereof. In another independent embodiment, the alkali metal salt is M(AlR2 aX4−a), such as LiAlPh3Cl, or MPF6, such as LiPF6. In some embodiments, M is lithium, sodium, or potassium. In an independent embodiment, the alkali metal salt is LiCl, LiAlCl4, NaCl, NaAlCl4, or a combination thereof. For example, the alkali metal salt may be a combination of LiCl and LiAlCl4, or a combination of NaCl and NaAlCl4. The magnesium salt and alkali metal salt may comprise the same anion, thereby avoiding anion metathesis to yield less soluble Mg salts such as, for example, [Mg2Cl3THF6]AlCl4 or [Mg2Cl3THF6]PF6. Thus, when the magnesium salt and alkali metal salt comprise the same anion, higher concentrations of the salts may be used compared to electrolytes in which the magnesium salt and the alkali metal salt comprise different anions. In some embodiments, the magnesium salt is a magnesium halide, and the magnesium salt and the alkali metal salt comprise the same halogen. In an independent embodiment, the magnesium salt is MgCl2 and the alkali metal salt is LiCl, LiAlCl4, NaCl, NaAlCl4, or a combination thereof. In an independent embodiment, neither the magnesium salt nor the alkali metal salt comprises a borohydride anion. In one embodiment, the electrolyte comprises (i) MgCl2, (ii) Al(C6H5)3 or CH3CH2AlCl2, and (iii) LiCl, LiAlCl4, NaCl, or NaAlCl4. In an independent embodiment, the electrolyte consists essentially of, or consists of, (i) MgCl2, (ii) Al(C6H5)3, CH3CH2AlCl2, or a combination thereof, (iii) LiCl, LiAlCl4, NaCl, NaAlCl4, or a combination thereof, and (iv) a solvent. Embodiments of the disclosed electrolytes further comprise a solvent. Suitable solvents include, but are not limited to, tetrahydrofuran (THF), acetonitrile, ethers (e.g., dimethyl ether (DME), dibutyl ether), glycol ethers (e.g., glyme (dimethoxyethane), diglyme (2-methoxyethyl ether), triglyme (triethylene glycol dimethyl ether), tetraglyme (bis[2-(2-methoxyethoxy)ethyl] ether)), and combinations thereof. p The concentration of magnesium in the electrolyte (where the electrolyte comprises a magnesium salt, a Lewis acid, an alkali metal salt, and a solvent) is at least 0.2 M, such as from 0.2 M to 2 M, 0.4-2 M, 0.5-2 M, or 1-2 M. The concentration of alkali metal in the electrolyte is at least 0.2 M, such as from 0.2 M to 3 M. 0.4-3 M, 0.5-3 M, 1-3 M, or 1.2-3 M. In an independent embodiment, 0.4 M≦[Mg]≦2 M, 0.4 M≦[alkali metal]≦3 M, or 0.4 M≦[Mg]≦2 M and 0.4 M≦[alkali metal]≦3 M. In another independent embodiment, 0.5 M≦[Mg]≦2 M, 0.5 M≦[alkali metal]≦3 M, or 0.5 M≦[Mg]≦2 M and 0.5 M≦[alkali metal]≦3 M. In some embodiments, the combined concentration of magnesium and alkali metal in the electrolyte is at least 0.4 M, such as from 0.4 M to 5 M, from 0.5 M to 4 M, from 0.6 M to 4 M, from 0.6 M to 2.5 M, from 1 M to 2.5 M, or from 1 M to 2 M. In an independent embodiment, 0.4 M≦[Mg]≦2 M, or 0.4 M≦[alkali metal]≦3 M, or 0.8 M≦[Mg]+[alkali metal]≦5 M, or a combination thereof. In another independent embodiment, 0.5 M≦[Mg]≦2 M, or 0.5 M≦[alkali metal]≦3 M, or 1 M≦[Mg]+[alkali metal]≦5 M. In still another independent embodiment, 0.6 M≦[Mg]≦2 M, or 0.5 M≦[alkali metal]≦3 M, or 1.1 M≦[Mg]+[alkali metal]≦5 M.
In some embodiments, the electrolyte has a magnesium to alkali metal molar ratio in the range of from 0.5 to 2, such as a ratio from 0.5 to 1.5 or from 0.7 to 1.2. The electrolyte may be prepared in a one-pot reaction or in a two-step reaction as shown in exemplary Schemes 1(a) and 1(b), respectively. The reaction products of the magnesium salt, the Lewis acid, the alkali metal salt, and/or the solvent can produce Mg2+ dimer monocations solvated by the solvent. The dimer cation can also be in an equilibrium with mono-Mg species, such as MgCl2(THF)x and/or [MgCl(THF)x]+(2≦X≦5). The resulting electrolyte produced by either reaction comprises 2 MgCl2—AlPh3/LiAlPh3Cl. In both reactions, the magnesium and lithium salts are formed through mono-chloride abstraction. In a solvent comprising THF, two equivalents of MgCl12 transfer one Cl− to the Lewis acid (e.g., AlPh3) and the resulting Mg2Cl3 core can complex with six THF molecules to form a [(μ-Cl )3Mg2(THF)6]+ cation or the co-existing MgCl2(THF)x and [MgCl(THF)x]+ (2≦X≦5). Corresponding reactions may occur when the Lewis acid is AlR3 zX3−z or BAlR3 zX3−z, where 0≦z≦3, and R3 is alkyl, aryl, alkoxide, aryloxide, thiolate, amide, or any combination thereof. Such Mg2+ dimer salts and [MgCl(THF)x]+ are electrochemically active for Mg2+ cycling, and either or both of them are believed to be significant contributors to electrical activity. Embodiments of Mg2+ dimer electrolytes are characterized by exceptional oxidation stability (up to 3.4 V vs. Mg), improved electrophilic susceptibility, high current density (up to 32.7 mA/cm2) and reversible Mg2+ ion plating and stripping (up to 100% Coulombic efficiency). Embodiments of the disclosed electrolytes are chemically and electrochemically stable, i.e., unwanted side reactions do not occur between components of the electrolyte solution during storage and/or battery operation. In some examples, MgCl2—AlPh3 electrolytes comprising LiCl, LiPF6, LiBF4, or LiAlCl4 showed excellent chemical compatibility as evidenced by cyclic voltammetry. Chemical compatibility is demonstrated when the electrolyte is repeatedly cycled (e.g., for up to 100 cycles or more) without significant changes in the voltammogram. Cycling stability can be quantified by the coulombic efficiency. Some embodiments of the disclosed electrolytes have a coulombic efficiency of 90-100%, such as 95-100%, over 100 cycles. The combination of MgCl2, AlEtCl2, and LiAlCl4 also demonstrated excellent chemical compatibility. Embodiments of rechargeable hybrid Mg-alkali metal ion battery systems 10 include an electrolyte 20 as disclosed herein, a magnesium anode 30 and an alkali metal ion cathode 40 (FIG. 1). In some embodiments, the alkali metal ion cathode is a lithium ion cathode or a sodium ion cathode. Suitable lithium ion cathodes include, but are not limited to, cathodes comprising Li4Ti5O12(LTO), LiFePO4 (LFP), LiCoO2 (LCO), LiMn2O4 (LMO), LiNiMnCoO2 (NMC), and LiNiCoAl2 (LNC). Suitable sodium ion cathodes include, but are not limited to, NaTiS2, NaNi2S2, NaCu2S, NaFeF3, NaFePO4, NaMnPO4, NaCaPO4, Na3V2(PO4)3, Na0.44MnO2, and NaNi0.5Mn0.5O2. In an independent embodiment, a rechargeable hybrid Mg—Li ion battery system comprises a magnesium anode, a lithium ion cathode, and an electrolyte comprising (i) MgCl2, (ii) LiCl, LiAlCl4, or a combination thereof, and (iii) Al(C6H5)3, CH3CH2AlCl2, or a combination thereof. In an independent embodiment, a rechargeable hybrid Mg—Li ion battery system comprises a magnesium anode, a lithium ion cathode, and an electrolyte consisting essentially of, or consisting of, a solvent, (i) MgCl2, (ii) LiCl, LiAlCl4, or a combination thereof, and (iii) Al(C6H5)3, CH3CH2AlCl2, or a combination thereof. In an independent embodiment, a rechargeable hybrid Mg—Li ion battery system comprises a magnesium anode, a lithium ion cathode, and an electrolyte comprising (i) MgCl2, (ii) LiCl, LiAlCl4, or a combination thereof, and (iii) Al(C6H5)3. In an independent embodiment, a rechargeable hybrid Mg—Li ion battery system comprises a magnesium anode, a LiFePO4 cathode, and an electrolyte comprising MgCl2, LiAlCl4, and Al(C6H5)3 in THF. In an independent embodiment, a rechargeable hybrid Mg—Na ion battery system comprises a magnesium anode, a sodium ion cathode, and an electrolyte comprising (i) MgCl2, (ii) NaCl, NaAlCl4, or a combination thereof, and (iii) Al(C6H5)3, CH3CH2AlCl2, or a combination thereof. In another independent embodiment, a rechargeable hybrid Mg—Na ion battery system comprises a magnesium anode, a sodium ion cathode, and an electrolyte consisting essentially of, or consisting of, (i) a solvent, (ii) MgCl2, (iii) NaCl, NaAlCl4, or a combination thereof, and (iv) Al(C6H5)3, CH3CH2AlCl2, or a combination thereof. Embodiments of the disclosed hybrid magnesium-alkali metal ion battery systems are rechargeable, have a greater voltage than magnesium batteries, have an improved cycling rate performance compared to magnesium batteries, and are safer than lithium batteries. Embodiments of the disclosed electrolytes allow use an alkali metal-ion intercalating cathode, thereby solving the prior problem of finding a suitable, compatible magnesium ion intercalating cathode. Some embodiments of the disclosed hybrid battery systems in which the alkali metal is lithium have a voltage of up to 4 V, such as a voltage from 2 V to 4 V. In comparison, a magnesium battery has a voltage of up to 1.2 V. The high voltage windows enable use of high rate/high capacity cathodes, such as LiFePO4, LiCoO2, LiMn2O4, LiNiMnCoO2, and LiNiCoAl2 cathodes. Embodiments of the disclosed battery systems show consistent cell performance as indicated by substantially similar charge and discharge capacities (e.g., charge and discharge capacities that vary from one another by less than 10% or less than 5%) at different charge rates for at least 5 cycles, at least 10 cycles, at least 20 cycles, or at least 30 cycles. The charge capacity and/or the discharge capacity may vary by less than 50% over 20 cycles, by less than 30% over 15 cycles, by less than 20% over 10 cycles, or by less than 10% over 5 cycles. In some embodiments, the disclosed battery system has a substantially constant voltage while charging and a substantially constant voltage while discharging. For example, the voltage may vary by less than 10% over a specific capacity ranging from 10-100 mAh/g. Electrolytes were prepared with MgCl2, AlPh3, and optionally LiPF6 in tetrahydrofuran (THF). 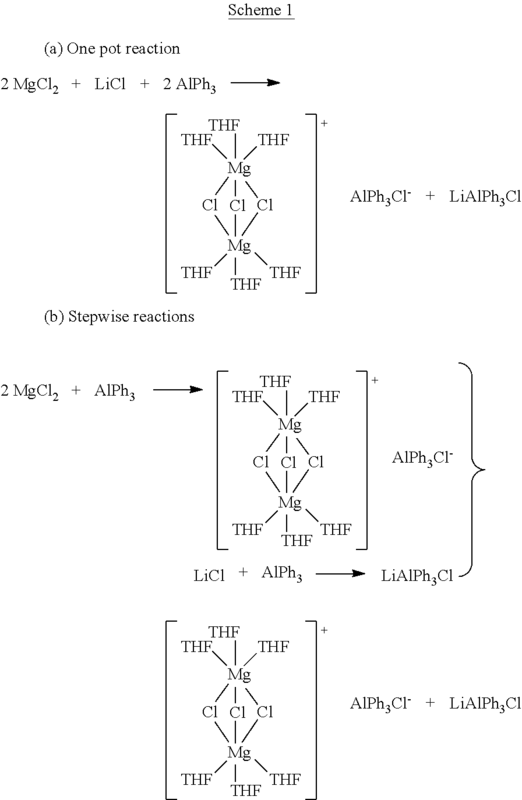 A suitable amount of MgCl2, or a mixture of MgCl2 and LiPF6, was suspended in THF, and AlPh3 solution (0.5-1 equivalent of MgCl2) was added dropwise. The resulting solution was stirred for 5 hours. The solution can be directly used for electrochemical studies or can be dried as powders. Alternatively, the active Mg electrolytes can be prepared from MgCl2 and AlPh3 separately (as described in US 2014/0302404 A1) and then mixed with LiPF6. Each electrolyte included 0.2 M MgCl2—AlPh3. The electrolytes included no LiPF6, 0.1 M LiPF6, or 0.2 M LiPF6. Cyclic voltammograms were obtained at 22° C., at a scan rate of 50 mV/s, with a Pt working electrode. The electrolytes including the alkali metal salt exhibited a much greater current density, i.e., more than twice the current density of the electrolyte without the alkali metal salt (FIG. 2). Cyclic voltammograms of each electrolyte were obtained at 22° C., at a scan rate of 50 mV/s, with a Pt working electrode. The results are shown in FIG. 3. As the electrolyte concentrations increased, current density increased until optimal current density occurred with electrolyte D—0.4 M 2 MgCl2—AlPh3/0.7 M LiAlPh3Cl—having a combined Mg2+and Li+ concentration of 1.5 M, and a current density of 24 mA/cm2. Further increased concentrations of both Mg and Li salts did not further increase current density, which might be due to increased viscosities of the resulting electrolytes. All of the electrolytes exhibited excellent electrochemical reversibility for Mg deposition and stripping. FIG. 4 shows repeated cyclic voltammograms (10 cycles) of 0.5 M 2 MgCl2—AlPh3/1.2 M LiAlPh3Cl obtained at a scan rate of 50 mV/s, Pt working electrode, 22 ° C. The overlapping voltammograms indicate 100% coulombic efficiency for Mg cycling. A coin cell including a Li4Ti5O12 cathode, a magnesium plate anode, and an electrolyte comprising 0.2 M MgCl2—AlCl3 and 0.2 M LiAlCl4 in THF was prepared. Cell cycling was performed at a charge rate of 0.1 C for cycles 1-7, 0.2 C for cycles 8-15, 0.4 C for cycles 16-22, and 0.1 C for cycles 23-30. The results are shown in FIG. 5. FIG. 6 shows representative charge/discharge profiles of the cell. The cell exhibited steady plateaus at approximately 0.8 V for charging and 0.65 V for discharging. A custom-made cell was used for the following test. To match the stability of the electrolyte at the high oxidation potential of LiFePO4 cathode (2.7 vs Mg), a carbon plate was used as a current collector for the cathode. Other traditional current collectors such stainless steel, Al, Ni or Cu can experience side reactions with the electrolytes above 2 V vs Mg. The cell also included a LiFePO4 cathode, a magnesium plate anode, an ion conductive separator, and an electrolyte comprising 2 MgCl2—AlPh3 (0.2 M) and LiAlCl4 (0.4 M) in THF. The LiFePO4 cathode has a high oxidation potential of 2.7 V vs. Mg. FIG. 7 shows representative charge/discharge profiles of the cell. The cell exhibited steady plateaus at 2.7 V for charging and 2.5 V for discharging. Cell cycling data is provided in FIG. 8. The data was obtained at a rate of 0.1 C. The cell capacity remained at approximately 160 mAh for the first 8 cycles. Gradual fading then occurred, which was attributed to a cell-sealing failure. 2. The electrolyte of claim 1, wherein the magnesium salt is MgX2, Mg(PF6)2, Mg(OR1)2, Mg(CF3SO3)2, Mg(N(CF3SO3)2)2, Mg(ClO4)2, or a combination thereof, wherein X is halo and R1 is aliphatic, aryl, alkoxy, aryloxy, thiolate, or amide. each R2 independently is aliphatic, aryl, alkoxy, aryloxy, thiolate, or amide. 4. The electrolyte of claim 3, wherein M is Li, Na, K, or a combination thereof. 0.4 M≦[Mg]≦2 M and 0.4 M ≦[alkali metal]≦3 M.
6. The electrolyte of claim 1, wherein 0.4 M ≦[Mg]+[alkali metal]≦5 M.
8. The electrolyte of claim 1, wherein the magnesium to alkali metal molar ratio is in the range of from 0.5 to 2. 9. The electrolyte of claim 1, wherein the Lewis acid comprises a metal M and one or more supporting ligands comprising one or more halide anions X, one or more organic anions R3, or a combination thereof. 10. The electrolyte of claim 9, wherein the metal M′ is B, Al, Ga, In, Fe, or a combination thereof. 11. The electrolyte of claim 9, wherein each organic anion R3 independently is alkyl, aryl, alkoxide, aryloxide, thiolate, or amide. 12. The electrolyte of claim 9, wherein the Lewis acid is M′R3 zX3−z, where 0≦z≦3. 13. The electrolyte of claim 1, wherein the Lewis acid is Al(C6H5)3, AlCl3, CH3CH2AlCl2, GaCl3, or a combination thereof. the alkali metal salt is LiCl, LiAlCl4, NaCl, NaAlCl4, or a combination thereof. an alkali metal ion cathode. 16. The battery system of claim 15, wherein the alkali metal ion cathode is a lithium ion cathode or a sodium ion cathode. 17. The battery system of claim 16, wherein the lithium ion cathode comprises Li4Ti5O12, LiFePO4, LiCoO2, LiMn2O4, LiNiMnCoO2, or LiNiCoAl2. LiCl, LiAlCl4, or a combination thereof. 19. The battery system of claim 16, wherein the sodium ion cathode comprises NaTiS2, NaNi2S2, NaCu2S, NaFeF3, NaFePO4, NaMnPO4, NaCaPO4, Na3V2(PO4)3, Na0.44MnO2, or NaNi0.5Mn0.5O2. NaCl, NaAlCl4, or a combination thereof.